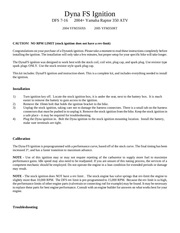 Ce document au format PDF 1.6 a été généré par Adobe Acrobat 7.0 / iText by lowagie.com (r0.95 based on version Paulo build 103), et a été envoyé sur fichier-pdf.fr le 16/02/2014 à 20:51, depuis l'adresse IP 88.141.x.x. La présente page de téléchargement du fichier a été vue 399 fois. Taille du document: 2.3 Mo (59 pages). 4) Remove starter from transmission. 5) Installation is in the reverse order of removal. 3) Disconnect connector and terminal from starter. 6) Installation is in the reverse order of removal. be forced endwise on shaft. 4) Disconnect connector and terminal from starter. In this test set up, pinion should return to its original position even when it is pulled out with a screwdriver. 5) Remove starter from transmission. 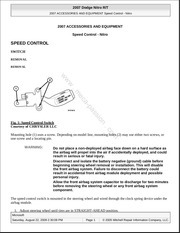 starter speed are within specifications. M to ground terminal (−) of battery with a lead wire. torque developed and current draw when the voltage is adjusted to the specified voltage. out at least the no-load test. spring from starter as a unit. washer may sometimes be used on the mounting surface of switch assembly. Record the direction of lever before removing. screws, and detach rear bracket and brush holder. a fit tool placed on stopper. (2) Remove ring, stopper and clutch from shaft. bearing will then be removed from the end of armature. and front bracket before removing yoke. Check the depth of segment mold. the brush holder at this time. is short-circuited, must be replaced or repaired. minor nature, correct it by using sand paper. Replace armature if it is grounded. Make sure pole is set in position. Inspect teeth of pinion for wear and damage. in opposite direction, it should be locked. a circuit tester (set in “ohm”). between terminal M and B. Do not clean overrunning clutch with oil to prevent grease from flowing out. Replace if abnormal wear or cracks are noticed. 2) Disconnect connector and terminal from generator. 2) Hold rotor with a vise and remove pulley nut. regulator and rectifier to remove IC regulator. of the vise to prevent rotor from damage. 5) Remove the brushes by unsoldering at the pigtails. 6) Remove the nut and insulating bushing at terminal B. Remove rectifier. 3) Unsolder connection between rectifier and stator coil to remove stator coil. this test; otherwise, the diodes may be damaged. good condition if continuity exists only in the direction from the diode lead to the heat sink. or shaft. If continuity exists, the rotor coil is shortcircuited, and so replace rotor assembly. good condition if continuity exists only in the direction from the heat sink to the diode lead. noisy or if rotor does not turn smoothly. using a lathe or sand paper. 9.52 oz), replace the brush spring with a new one. 5.786 N (470 to 590 g, 16.58 to 20.81 oz). brush has the service limit mark on it. (1) Remove front bearing retainer. wrench can serve as the tool. To assemble, reverse order of disassembly. Be sure to remove the wire after reassembly. tool on the bearing outer race. Press the bearing down into place with a hand press or vise. A socket wrench can serve as the tool. (4) Install front bearing retainer. bracket. Then lubricate the rear bracket. Grease should not be applied for the rear bearing. check that the rotor turns smoothly. (3) Remove air intake duct as a unit. of the same heat range. element. (Except 2200 cc California SPEC. (1) Disconnect mass air flow sensor connector. 2) Remove air intake duct and resonator chamber. on the front side of body. cleaner upper cover from air intake duct. (4) Remove air cleaner element. 5) Remove spark plug with the spark plug socket. 3) Remove spark plug with the spark plug socket. 4) Installation is in the reverse order of removal. 2) Disconnect washer motor connector. 6) Remove spark plug with the spark plug socket. 7) Installation is in the reverse order of removal. new spark plugs without oil on their threads. specified torque in order to avoid over-stressing. wear indicate correct spark plug heat range. repair, use a hotter plug. Clean spark plugs in a sand blast type cleaner. Avoid excessive blasting. Clean and remove carbon or oxide deposits, but do not wear away porcelain. If deposits are too stubborn, discard plugs. plug gap using a gap gauge. the presence of a short-circuit. 4) Remove ignition coil and ignitor assembly. Be sure to connect wires to their proper positions. Failure to do so will damage unit. Magnet switch does not operate. Starter starts but does not crank engine. Starter starts but engine cranks too slowly. Magnet switch coil is a layer short. I Reassemble parts in reverse order of disassembly procedure unless otherwise indicated. I Connect connectors and hoses securely during reassembly. 1) Disconnect the positive (+) terminal after disconnecting the negative (− ) terminal of battery. I All Airbag system wiring harness and connectors are colored yellow. Do not use electrical test equipment on these circuits. then the negative (− ) terminal of the battery. I Avoid contact with skin, eyes or clothing. because a short circuit will be caused. a dry cloth. Apply a thin coat of grease on the terminal posts to prevent corrosion. cell. Do not fill beyond MAX LEVEL. be charged, according to corrected specific gravity. I Observe the items in 1. NORMAL CHARGING. *: Check electrical system before replacement. I Do not bring an open flame close to the battery at this time. I Be careful since battery electrolyte overflows while charging the battery. aiming, do not turn on for more than two minutes. any accident, damage or other type of deformation. I Vehicle is parked on level ground. I The inflation pressure of tires is correct. I Vehicle’s gas tank is fully charged. I Make certain that someone is seated in the driver’s seat. to loosen and remove the ignition switch. Do not perform lateral headlight aiming adjustment. groove portion of the rubber cap. 5) Attach the rubber cap and connect the connector. do not touch the glass portion. 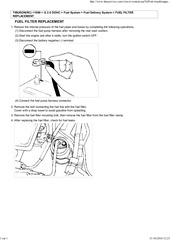 3) Remove screws and bolts which secure headlight and remove headlight. into locating (on side marker light side). 2) Remove nuts and disconnect connector. as this may scratch vehicle body. I Attach butyl rubber tape to back of rear combination light before installing rear combination light on body for sealing purposes. cover to lower column cover. 3) Disconnect connector from combination switch. and check continuity between terminals. and terminal No. 3 is grounded. 1) Turn the wiper switch to OFF position. 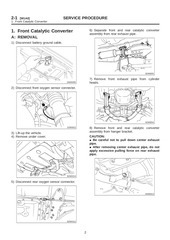 figure by changing wiper arm installation. from arm while pushing up locking clip. 2) Installation is in the reverse order of removal. wiper arm, and remove wiper arm. glass as shown in figure when vehicle stops. 3) Installation is in the reverse order of removal. cowl net to facilitate removal. 4) Remove nuts which secure sleeve unit. for proper operation at low speed. 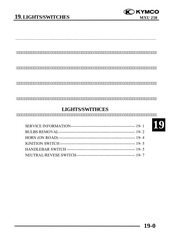 Set wiper switch to each position and check continuity between terminals. for proper operation at high speed. in figure by changing wiper arm installation. 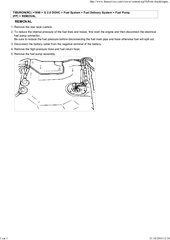 2) Adjust washer ejecting point on rear gate window as shown in figure when the vehicle stops. 2) Remove nut and wiper arm. Be careful not to damage O-ring when removing wiper motor assembly. 1) Remove cap and special nut. 1) Remove rear quarter trim. 2) Disconnect washer hose and connector. 3) Undo clips which secure harness, and disconnect connector of wiper motor. 4) Separate washer hoses at joint. stops at “AUTO STOP” after it has been operated. Connect battery to wiper motor and check operation of wiper motor. 2) Check continuity between terminals. 2) Turn defogger switch ON. discontinuity by setting direct current voltmeter. I Normal indication is about 6 volts. against the wire with your finger. slowly moving tester probe toward the positive terminal. 1) Clean broken wire and its surrounding area. in) width and 10 mm (0.39 in) length. (DUPONT No. 4817) on the broken portion. 4) Dry out the deposited portion. 5) Inspect the repaired wire for continuity. 1) Move steering wheel most down. meter, and pull combination meter out. connect connectors to backside of combination meter. 2) Remove front fog light cover. 2) Remove AT cover (AT model). fog light from front bumper. 2) Remove screws which secure front speaker. 3) Remove speaker and disconnect connector. Remove rear shelf trim panels. Remove screws which secure rear speakers. Disconnect connector and remove speakers. 2) Remove screws which secure rear speaker. 1) Remove air intake chamber. 6) Remove actuator attaching bolts. 2) Remove air intake chamber stay. 3) Remove clip bands from cruise control cable. 8) Installation is in the reverse order of removal. manifold, apply sealant to the fitting hose. bend permanently, resulting in poor performance. otherwise, the cable may break. remove two TORXT bolts which secure driver’s airbag module. 2) Remove panel lower cover. 4) Remove main switch by pushing it outward. switch connector, then remove cruise control command switch. 1) Set front wheels in straight ahead position. 2) Turn ignition switch OFF. 1) Remove front pillar lower trim. 2) Disconnect connector from cruise control module. 3) Remove bolt, then remove cruise control module. Ce fichier a été mis en ligne par un utilisateur du site. Identifiant unique du document: 00223501.